I re-started this hobby in May 2011, after almost two decades. Since I was mentioning the Ace250 yesterday, I grew nostalgic about the first few months of this adventure. I began with the Ace250 and quickly and by sheer luck I began to find gold. I couldn’t find the pictures of my finds with the Ace in my computer (I changed computers a couple of times since 2011) so I went to the forums to retrieve some. This particular Ace250, gave off a penny signal every time I hit gold. I expected a pull tab signal or some other mid tone but the Ace would give off that bell tone and faithfully indicate that there was a one cent coin in the ground. I didn’t know at the time how unusual this was. Alas! I used the Ace only for three months, after it paid for my ATPro. Eventually I sold it to finance the purchase of a new coil. I know the person I sold it to turned around and sold it again and I wonder who’s finding gold with it now. It is hard to go back to digital bell tones once you try variable sound but if I was sure that it was my old Ace, I would buy it back in a second. I have found gold since with my other detectors but now I have to dig mid tones if I want gold. Also, as a side note, I quit posting gold finds. 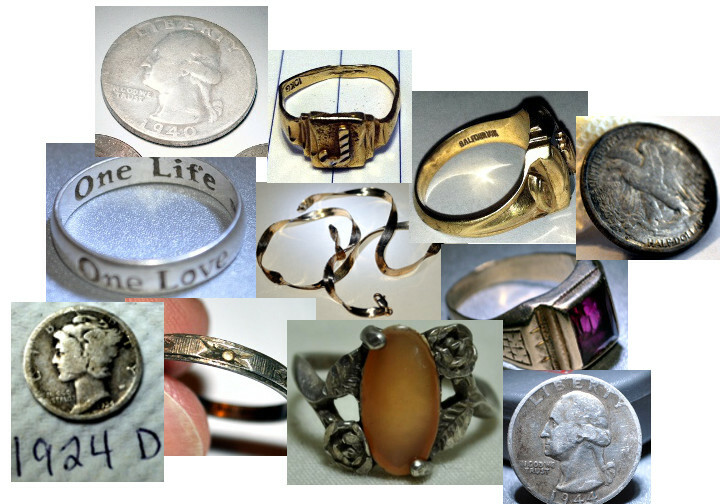 I, like just about every other metal detectorist out there, will make a big effort to locate the owner of lost rings I find. None of the rings I found with the Ace had any identifying information on them and some were so deep that I doubt the original owner was even around. But I have grown more careful with time and I decided some time ago that gold finds will remain a secret (not that I’ve found that much gold lately!). I think that I have just now equaled the gold finds of the Ace with all my other detectors since, including the Deus. Like they say, one never knows a good thing until it’s gone. Anyway, thank you for stopping by. When I first got my Ace 250, I played with the settings and struggled to make sense of the sounds. I hunted one way for a couple of days and then I changed the settings, as much as you can on the Ace 250, and then hunted that way for a couple of days more. Meanwhile, the cacophony of sounds wrecked havoc in my brain. Eventually though, I settled on the Jewelry mode as my preferred mode for hunting and by then, the sounds coming out of the 250 were as familiar to me as my own face. The findings reflected my new mastery of the detector. Silver coins, gold rings, and relics oh my! No sooner did I feel the commander of the Yellow Wonder that I decided I needed more power. So into my life a little AT Pro came. Actually, a lot of AT Pro came. Although the AT Pro comes with the Standard mode, which makes it kind of an Ace 250 on Dilithium crystals, I, being the manly man I am, did not bother to use it. I jumped into the Pro mode right away. My brain had to contend with new tones and new features such as an adjustable Ground Balance. I had to learn a new coil as well. So the purchase of the AT Pro set me back to the proverbial Stone Age. Eventually, through hard work and dedication, I mastered the AT Pro as well. The Pro became a magic wand and I became the Dirt Wizard and all mysteries below the ground were revealed to me. Again, after an initial dearth of good finds, my knowledge of the machine allowed me to find cool stuff again. If you are in any way like me (God help you!) at some point, before you have the money to upgrade and after you feel you have gotten all the juice out of your equipment, you start looking for ways to expand the detector you have. And that’s what I want to talk about. I know, kind of a long tirade before I got to the point! One way to expand your detector is to maximize its depth by not using discrimination. When you first start detecting, you seek refuge into the warm and fuzzy place that is Discrimination. Discrimination keeps you from having to listen to the ugly truth the dirt is telling you. And that truth is that there is a 10,000 to 1 ratio of trash to good finds. (Ok, so maybe I exaggerate a little but before you judge me, hunt some of the parks around here). You live in High Tone City and all is good. However, as they say around here, there is no such thing as a free lunch and using discrimination on your detector comes at a price and that price is depth. Yes, when you use discrimination you lose depth. The reasons for this involve magic and unicorns and such but it is true. Ask any metal detector engineer and they will tell you so. To get the most depth out of your coil/detector combo, you need to open up the machine. You have to grow up so to speak. You have to learn to handle the truth. I have done it with both the Ace 250 and the AT Pro in an attempt to squeeze just a little more depth out them. And you know what? It wasn’t that bad. Eventually, I got to like knowing what’s under the ground. Iron and all. So now that I have my V3i, I find myself in that familiar territory. I have been lost in the wilderness of settings and I am coming out ready to open the machine up. I need to find dimes at twelve to fourteen inches deep. I do. I have a park loaded with silver dimes, all beyond the nine inch level. Wish me luck. 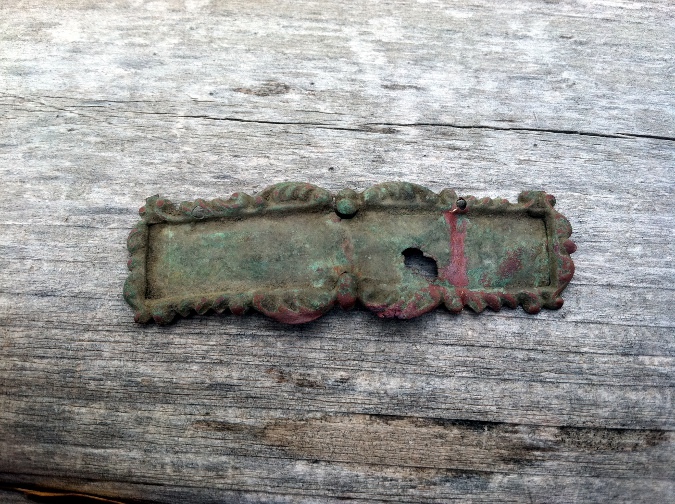 After five months detecting, I finally learned what iron masking is really about. I found a couple of dimes sitting next to rusty iron a little while ago and I thought the V3i could handle iron masking really well but it turns out that iron masking cannot be defeated by any detector in the market today. So what is Iron Masking you may ask? Iron masking is when a piece of iron is laying over a good target but IS NOT TOUCHING THE GOOD TARGET. I have seen tests on you tube by people trying to prove that their detector can see through iron and so they put a rusty nail on top a coin and then proceed to detect the coin under the nail. The problem with that kind of test is that the iron and the coin are touching so the detector reads them both and then gives an averaged value. Also, the iron has to be covering a good percentage of the coin; iron to the side of the coin doesn’t mask the coin. The real test is this: take a small plastic pill bottle and put a coin inside of it so that the coin rests at the bottom of the pill bottle. Then, put a piece of iron across the top of the bottle so that the iron rests directly above the coin. Then run your metal detector over the pill bottle. I just read about this test in one of the forums out there. When I get home, I want to actually try this and film it. I will update this post and add the video. I have three detectors and I will try them all. Maybe later I will ask my friend to try his brand new Fisher F4 on the pill bottle as well. What I am curious about is what happens if part of the coin is not being covered by the piece of iron. Would I get a weird signal kind of like a low signal and a high peep? I’ll just have to test. I went out for a lunch-time hunt today. The weather was perfect and I met two members from the Friendly Metal Detecting forum at the park. I hunted with my Ace 250 and I was digging every consistent mid tone. I found two nickels and a clad quarter plus the usual trash you find when you dig mid tones; pull tabs, can slaw, and foil. I know there is lots of gold in that park and I aim to get it all. At the recommendation of a member of the Friendly Metal Detecting forum, a hunting buddy and I went to a city nearby to hunt the city parks. I got there almost at nine in the morning and stayed until eleven. 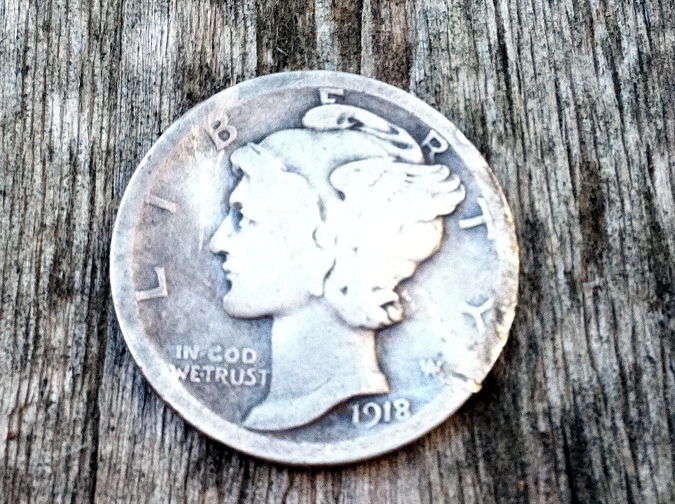 In that time I stayed in a relatively small area of this big city park and found eight wheat cents, the earliest being a 1925, and a 1918 Mercury dime. This dime makes silver coin #33 for the year. The park, we were told, has been open for as long as the city has been there. It is a large park and we will definitely go back. I used my Garrett Ace 250 for this hunt since my At Pro is boxed and ready to be shipped away for repairs. I went out with the Ace 250 this morning to look for gold. It was very cold and windy but eventually it warmed up a bit. I did not find any gold; I only found some clad coins and this Airforce Insignia. It is a chevron for an airman. It may have had a star in the middle at one point. 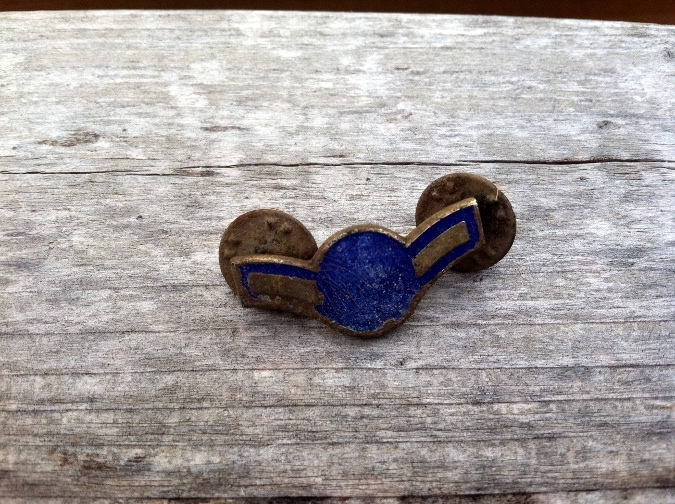 It was made by the International Insignia Corporation, a modern maker of insignia for the military. Before I viciously wounded my AT Pro, I went to a soccer field behind a middle school here in Wichita. I was told the field is a private field but the owner allows the school and the community to use it. Again, I was looking for gold there with my Pro and I found this tag. The tag says Whitehead & Hoag Co. Newark N.J. on the back. It also says “Pack Aug.1.99”. This tag was about seven inches deep and it gave a nice, high tone. Whitehead & Hoag LLC was one of the largest advertisement firms in the world at the turn of the century. They had huge contracts with companies like: Boeing, US Governtment, Guiness, Bud, Bass Ale, Starret, Bartels, Worlds Fair, and hundres more. They were also responsible for the patent of “Celluloid” A high quality compound used for printing that made the prints more durable and vibrant in color. What really excites me is that this tag dates the soccer field which used to be a farm back in the day. I wonder what other awesome goodies lie beneath!